Whole-plate daguerreotype. Before 1842. Gilt-edged passe-partout. Inscribed Au Cte de Clarac par son ami le Bon Séguier Amicitié signum vente de Clarac - avril 1847 in ink on the reverse of the backing paper. A rare early French still-life daguerreotype by one of the masters of the genre. This daguerreotype is believed to have been made significantly earlier than the inscription date of 1847. The inscription refers to a sale, which is likely to be the auction of the Count of Clarac's property on 19 and 20 April, 1847, in Paris. Séguier was actively making still life daguerreotypes as early as 1839 and this plate does not appear to have been gold-toned, indicating a likely date prior to 1842, by which time gold-toning was in common use. The toning enhanced the contrast and intensity of the image and was used almost universally once available. 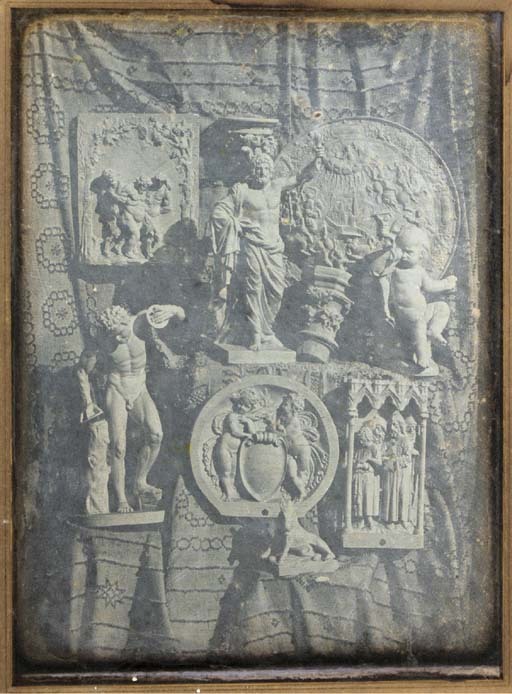 According to Janet Buerger, the combination of the full plate and still life was used by a few early masters of the daguerreotype process including Daguerre, Hubert, Fortier, Séguier and Baron Gros (French Daguerreotypes, p. 19-20.) Séguier is perhaps best-known for having introduced the chambre pliante, a camera with leather bellows enabling it to fold. He was an academician and chemist, and a founding member of the Société Française de Photographie.